Baedeker editions covering Central and Northern Germany in German. Before edition 4, this area was covered in the general Germany edition. 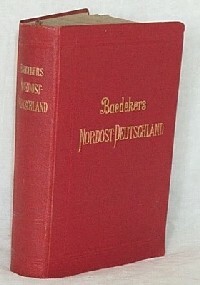 The volume on Nord-Deutschland (1936) is edition no. 6; it corresponds to edition 6 of Deutschland in 1 Bande, but is a companion to S�ddeutschland. The corresponding English editions are called Northern Germany, while the area is covered in French by the French editions of Allemagne et Autriche or Allemagne du Nord. Editions on Berlin are dealt with separately.